Jon Stewart is hosting the MusiCares salute to Bruce Springsteen. 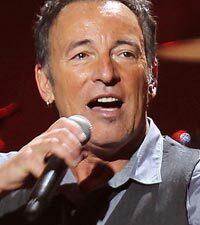 The Recording Academy also announced Wednesday that Elton John, Neil Young, Mumford & Sons, Sting, Mavis Staples and Kenny Chesney will be among more than a dozen performers who will help pay tribute to Springsteen during the Feb. 8 benefit concert, held in Los Angeles two days before the Grammy Awards. Springsteen is MusiCare's person of the year, an award given to a performer who is notable both artistically and philanthropically. The sold-out concert will benefit MusiCare's emergency financial assistance and addiction recovery programs. Other performers scheduled to appear include Juanes, Tim McGraw and Faith Hill, Jackson Browne and Alabama Shakes. Stewart is the host of Comedy Central's "The Daily Show With Jon Stewart."